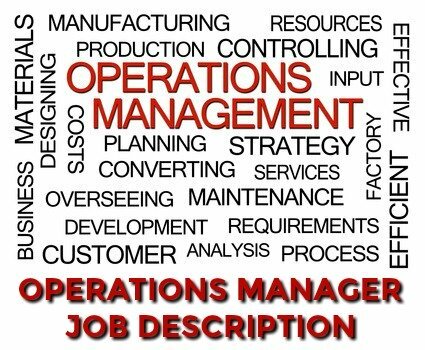 The operations manager job description defines the core duties and responsibilities of the operations manager role. Regardless of the type of industry or organization the main purpose of an operations manager is to plan and direct operations and improve productivity and efficiency. The methods and strategies used to achieve this vary from company to company but there are standard duties and responsibilities associated with ensuring the smooth operational procedures of the company. Operations managers plan, direct and coordinate the operations of an organization. The general operations manager is responsible for ensuring and improving the performance, productivity, efficiency and profitability of departmental and organizational operations through the provision of effective methods and strategies. Financial - Review financial statements and data. Utilize financial data to improve profitability. Prepare and control operational budgets. Control inventory. Plan effective strategies for the financial well being of the company. Human Resources - Plan the use of human resources. Organize recruitment and placement of required staff. Establish organizational structures. Delegate tasks and accountabilities. Establish work schedules. Supervise staff. Monitor and evaluate performance. Production - Coordinate and monitor the work of various departments involved in production, warehousing, pricing and distribution of goods. Monitor performance and implement improvements. Ensure quality of products. Manage quality and quantity of employee productivity. Manage maintenance of equipment and machinery. Provide technical support where necessary. Communication - Monitor, manage and improve the efficiency of support services such as IT, HR, Accounts and Finance. Facilitate coordination and communication between support functions. Sales, Marketing and Customer Service - Manage customer support. Plan and support sales and marketing activities. Strategic Input - Liaison with top management. Assist in the development of strategic plans for operational activity. Implement and manage operational plans. The formal education and experience for the operations manager job description varies according to the nature of the job responsibilities. However the following are commonly required in the operations manager role. College degree in business administration, commerce, management, industrial technology or industrial engineering. Certain schools offer bachelor's and master's degrees in operations management. Need help writing a good resume? Use this sample resume template to help you. Sample Cover Letters to submit with your job application. Use these management job interview questions with interview answer guidelines to prepare for your operations manager job interview. Indeed.com reports that the average salary for Operations Manager job postings on the site is $62,100 per year as of April 2019 in the United States.